Tunisian Foreign Minister Rafik Abdessalem arrived in Gaza for a brief visit on Saturday morning — under continued firing and bombardment, without any truce arrangements — ahead of an emergency Arab League meeting scheduled for 3:00 in Cairo. The Tunisian FM’s crossing into Gaza via Rafah border point was announced by Hamas. The IDF later released a video of their strike on this building. It was Tweeted by Grant Rumley [@Grant_Rumley]: “IDF releases video of air strike on #Hamas’ PM Haniyeh’s headquarters here. The Tunisian FM reportedly addressed crowd in Gaza, and called for a stop to Israeli aggression. He also urged all Arab leaders to visit Gaza. Other targets reportedly struck in Gaza either overnight or this morning include: the Interior Ministry, again; the Parliament building [as in 2008]; the Police Headquarters [also as in Operation Cast Lead — but this time empty or nearly so at 03:30 am, without a courtyard full of graduating cadets, so 275 were not killed]; the football or sports stadium; tunnels in Rafah. The IDF also Tweeted that “Palestinian [outgoing] mortar fire damages electricity cable in southern Israel resulting in power outage in #Gaza”. By middday in Jerusalem, the Palestinian death toll had risen to 39. And, there were reports of further talks being conducted in Cairo concerning a possible cease-fire between Israel + Hamas. Overnight, U.S. President Obama called Egypt’s President Morsi and Israel’s Prime Minister Netanyahu [who thanked Obama for Iron Dome funding and other defense support]. Today is Day 3 of the IDF’s Operation “Pillar of Clouds”, also known as Operation Defense Pillar against Gaza. Last night, two Fajr rockets fired from Gaza reached the Tel Aviv area. [Qassam Brigades were calling them Qassam M-75s.] Earlier in the day, three Israelis were killed by shrapnel after a direct rocket hit on the top floor of an apartment building in Kiryat Malachi. Overnight, the IDF carried out at least 150 strikes on the Gaza Strip, including on on the Civil Affairs office in the Ministry of Interior in Gaza. UNRWA photographer Shareef Sarhan took this picture showing the damage to the Civil Affairs office. here. Other pictures are viewable on the Activestills Flikr page photostream, here. The Palestinian Center for Human Rights [PCHR] sums it up: The “most significant targets was the building of the Civil Department of the Ministry of Interior in Tal al-Hawa neighborhood in the south of the City. The building was totally destroyed and a number of nearby buildings and houses were heavily damaged. Israeli fighter jets bombarded also the building of the Collection and Inspection Center of Gaza Municipality near Abu Mazen Square. The building was completely destroyed and a number of nearby houses and buildings were heavily damaged. Israeli fighter jets further bombarded a plot belonging to an ecclesiastic center near the Roots Restaurant in the southwest of Gaza City. Additionally, Israeli gunboats bombarded an electricity transmitter near the house of Prime Minister Ismail Haniya in the Beach camp. A number of houses and a civilian car were heavily damaged”. PCHR has called for an urgent meeting of the UN Human Rights Council in Geneva to examine the situation. As to the UN Security Council, well, it met on Wednesday night after a request from Egypt, but took no decision. The only outcome was a decision that UN Secretary-General BAN Ki Moon would travel to the region on Tuesday — but he does not intend to go to Gaza. UNSG BAN Ki-Moon will apparently have talks in Israel on Wednesday. Mahmoud Abbas announced to the PLO Executive Committee this evening that UNSG BAN would be coming to Ramallah on Thursday. On Friday morning, a delegation of Egyptian officials led by Prime Minister Qandil and accompanied by Egyptian Special Forces entered Gaza on Friday morning to assess the situation, and were received by Hamas’ Ismail Haniyeh. As they entered Shifa Hospital in Gaza City, a small child who had just died from an Israeli strike was brought in, and the two men cradled the body. The photo was posted on Twitter by Hazem Balousha [@iHaZeMi]. Pool photo by Mahmud Hams. Israeli Prime Minister Netanyahu said Israel would serve a 3-hour cease-fire for the visit of the Egyptian delegation on condition that no projectiles were fired from Gaza onto Israel — but there was very little let-up. Several journalists in Gaza reported outgoing projectiles. Journalists also reported incoming [though IDF spokespeople said there were no attacks during the Egyptian PM’s visit. A little later, there was an execution of a collaborator in Gaza, which the NYTimes reported on, here. 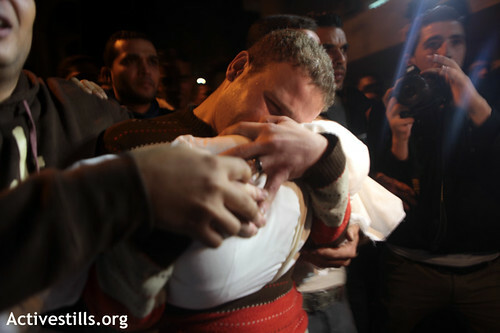 By the end of the day [Friday] the Palestinian death toll in Gaza rose to 30, with some 250 injured — and climbing. There were no Israeli deaths from Gaza firing reported on Friday. Today, 15 November, is Palestinian Independence Day. The employees of the Palestinian Authority [PA] in the ministries in Ramallah and elsewhere in the West Bank are off work for what will be a 3-day holiday. In a rare sign of solidarity, the otherwise disgruntled Palestinian East Jerusalem merchants will also close their shops to mark the date that Yasser Arafat declared the independent Palestinian state, at a meeting of the PLO’s Palestine National Council in Algiers. In Gaza, people are reeling under [another] full-scale Israeli attack — this one, like the previous ones, designed to “bring about an improvement in the security reality and allow a normal life for the residents of the State of Israel” [Israeli Security Cabinet communique Wednesday evening 14 November]. The Security Cabinet also stated that “Alongside the military effort, Israel will, to the best of its ability, work to avoid harming civilians while honoring the humanitarian needs of the population, in keeping with the rules of international law”. Israel’s new-found appreciation of international law dates to the fallout from its interception of the Freedom Flotilla on the high seas in the eastern Mediterranean at the end of May 2010. A handful of Israeli special forces boarding the 600-passenger Mavi Marmara in the dark were outnumbered and surrounded, and killed 9 Turkish men, including one Turkish-American high school student. Without dwelling on the academic distinction between “international law” and “international humanitarian law [which pertains in situations of occupation, for example] it has to be said that there is wide room for various argued-understandings of the construct. Photo by Anne Paq of Activestills, posted on the Flickr photostream here. One of the accusations against Jaabari was that he was responsible for the operation that captured IDF Corporal Gilad Shalit just outside the Gaza perimter near the Israeli crossing of Kerem Shalom in June 2006. Shalit was held somewhere in Gaza until his release in October 2011 — after Egyptian-brokered negotiations carried out with Jaabari. Noam Shalit, Gilad’s father, said on Wednesday evening after the “precision” strike that hit Jaabari’s car in Central Gaza, that Gilad was “still absorbing” the news. Abbas: "We're going to the UN on 29 November"
Palestinian leader Mahmoud Abbas said at an Arab League meeting in Cairo tonight that he and Arab League Secretary-General Nabil al-Araby had agreed that the Palestinian UN General Assembly move to upgrade the status of Palestine to [non-member] state would be on 29 November. In Cairo, Abbas said that the Palestinians were going to the UN now — and could not wait for elections in Israel “and then elections in Mozambique and then elections in Congo…”. November 29 will be the 65th anniversary of the UN General Assembly vote to partition Palestine, as a way of resolving, at British request, the troubled situation, and of dissolving the Mandate the British had been awarded by the League of Nations a quarter of a century earlier. In recent decades, the UN has commemorated the day as the International Day of Solidarity with the Palestinian People. Abbas told journalists, according to AFP, that: “We don’t want any confrontations with the United States or Israel. If we could start a dialogue or negotiations the day after the vote, we will … We know we are a country under occupation, but we want our land which was occupied in 1967, including Jerusalem. Israel says Palestinian lands are disputed and open to negotiation, and is hurrying to build settlements, covering Jerusalem with settlements”. This is published here. Earlier, in Ramallah, the PLO gave a briefing about the move. Muhammad Shtayyah explained that the text of the draft resolution that is now circulating, authorizing Palestine’s UN upgrade to [non-member] state, is already “outcome of negotiations” — in fact, he said, of months of negotiations. Shtayyah said that the Palestinians were sure of having the necessary number of votes to pass the measure. Shtayyah noted that the Palestinian delegation is, however, still working to accommodating certain countries’ requests for more clarity or amendments. “Between today and the 29th [November] is consultations, so the resolution is not final + is now open for consultations”, Shtayyah told reporters. The UN move is “to pressure for serious negotiations + an end to occupation — or there’s no point”. Shtayyah added, with some impatience. “Negotiations have to address the freeze of settlements, which should be frozen as we have always been saying”. The upgrade in status would “change the terms of reference for the negotiations”, Shtayyah said. “If not”, Shtayyah said, “Israel will hear through the organs of the UN, asking to put a timetable for their withdrawal”. Continue reading Abbas: "We're going to the UN on 29 November"
Posted on 12 November 2012 Author Marian HoukCategories Israel, Palestine & Palestinians, UN General AssemblyTags Jordan Valley, Mahmoud Abbas. Muhammad Shtayyah, Non-member observer state, UN General Assembly, Yitzhak MolchoLeave a comment on Abbas: "We're going to the UN on 29 November"
Abbas: "We're going to the UN in November 2012, not 2013 or 2014"
Amidst threat of financial reprisals, pressure lobbying and media pressure, Palestinian leader Mahmoud Abbas said today: “We’re going to the United Nations in November 2012, not 2013, or 2014”. This was reported on Al-Akhbar, here. Abbas is Chairman of the Executive Committee of the Palestine Liberation Organization [PLO]. which is supposed to function as Provisonal Government of the State of Palestine [declared by the PLO’s Palestine National Council in 1988]. Pn that basis, Abbas last year signed his name as President of the State of Palestine in the request he submitted for admission of Palestine as a full member of the United Nations, As that was blocked by the U.S. [acting on behalf of Israel] Abbas is apparently now determined to pursue this half-way measure, and will soon request “non-member state” status in the UN. But in his article, Ravid reports that Abbas said, in effect, no. Ron Kampeas reported a little later for the Jewish Telgraphic Agency here that the White House had finally put out a statement about the call, saying that “Obama was returning Abbas’ congratulations for winning last week’s U.S. reelection. Obama returned a similar call to Netanyahu last Thursday”. Continue reading Abbas: "We're going to the UN in November 2012, not 2013 or 2014"
Posted on 11 November 2012 Author Marian HoukCategories Israel, Palestine & Palestinians, UN General AssemblyTags Non-member observer state, Palestinian leader Mahmoud Abbas, State of Palestine, UNGA move, upgrade statusLeave a comment on Abbas: "We're going to the UN in November 2012, not 2013 or 2014"
A draft UN General Assembly resolution was circulated yesterday by the Palestine observer delegation to the UN, asking for support for upgrade of status in the international organization. This proposal will be submitted to the General Assembly “at a date to be announced in the near future”, a covering note said. The document was posted online, here, by Matthew Lee, a blogger who is accredited to the UN in New York for his blog, Inner City Press. The document’s operative paragraphs, which are many, start out with a reaffirmation of “the right of the Palestinian people to self-determination and to independence in their State of Palestine on the basis of the 1967 borders”. It notes that, to date, 132 UN Member States have recognized the State of Palestine. The draft resolution also has a proviso guarding the “rights, privileges and role of the Palestine Liberation Organization as the representative of the Palestinian people”. And, the draft “expresses the hope that the [UN] Security Council will consider favorably the request submitted on 23 September 2011”, which was for full [and not just observer] UN membership of the State of Palestine. “A senior Palestinian official said Friday that Palestinian Authority President Mahmoud Abbas may be willing to postpone a move for upgraded UN status if the US were to offer a ‘clear objective’ for negotiations, Israel Radio reported. According to the official, the objective must be a Palestinian state based on 1967 borders, with East Jerusalem as its capital. Other Palestinian sources also indicated that Ramallah would be willing to reconsider a unilateral push for nonmember state status, tentatively scheduled for late November, if real suggestions were offered for ending the Israeli occupation of Palestinian territories, according to the report”. Why would the Palestinians cave so fast? The Palestinian presidential spokesperson Nabil AbuRudeineh, denied the reports of any caving in, telling Maan News Agency that the decision to go to the UNGA had been made and would not be changed. going to take them any closer to having what they really want and need, which is a functioning, independent state living at peace with Israel”. In an effort to reassure the U.S., the Palestinian leadership intends this UN move to be immediately succeeded by a Palestinian willingness to return to negotiations [“without preconditions”, as the Palestinian objection to Israel’s settlement-building has been portraryed]. Indeed, the draft resolution also states that there is an urgent need for the “resumption and acceleration of negotiations within the Middle East peace process…for a just, lasting and comprehensive peace settlement between the Palestinian and Israeli sides that resolves all outstanding core issues, namely the Palestinian refugees, Jerusalem, settlements, borders, security, water and prisoners”. The New York Times reported that Israeli Foreign Ministry spokesperson Yigal Palmor Mr. Palmor said “that Israel was ready for negotiations at any time but that the Palestinians had set preconditions. He said that enshrining outlines for negotiations in a United Nations resolution was problematic. The Palestinians, he added, would use any enhanced status to try to join additional United Nations organizations as well as other international bodies like the International Criminal Court, where they could attempt to sue Israel for activities like settlement building”. This is published here. The UNGA move is described, in the draft resolution, as an effort to contribute to “the achievement of the inalienable rights of the Palestinian people and the attainment of a settlement in the Middle East that ends the occupation that began in 1967 and fulfills the vision of two states…on the basis of the 1967 borders, with the delineation of borders to be determined in final status negotiations”. Israeli officials have, meanwhile, said that the Palestinians should postpone their UN move until after Israeli elections which are now scheduled for 22 January. So far, Abbas has only said that he will go to the UNGA for an intermediary move “this month”. Haaretz reported today, here, that “Arab League foreign ministers are expected to discuss the draft and the timing of its submission at a meeting in Cairo on Nov. 12-13, a Palestinian diplomat said, speaking on condition of anonymity because he was not authorized to speak publicly”. That would make November 15 the first possible date for tabling the resolution. On 15 November 1988, Yasser Arafat declared the independence of the State of Palestine at a meeting of the Palestine National Council [PNC] in Algiers. The PNC approved the declaration, and a separate resolution saying that this state would be established in the territory occupied by Israel in June 1967 [the West Bank, including East Jerusalem, and the Gaza Strip]. The PNC also authorized, at the same meeting, the Palestine Liberation Organization’s Executive Committee to function as the provisional government of this State of Palestine. One of the best things about the results of this presidential election is that there will be no pause during a “lame duck” period. Barack Obama will have to continue to work — with renewed determination and energy, as he said in his victory speech which we were able to see in the morning in Jerusalem + Ramallah. Abbas has already sent his congratulations to Obama. Sa’eb Erekat, the Chief Palestinian negotiator, said that Obama must now help try to stop settlements, and not block the apparently-imminent Palestinian move in the UNGA to upgrade from observer organization / “entity” to observer [but still non-member] state. The U.S. Ambassador to Israel Dan Shapiro this morning said the Palestinian UNGA move would be “unhelpful”, but noted that the U.S. has an interest in maintaining the PA in the West Bank — despite Israeli plans to retaliate to the UNGA move. The U.S. State Department has recently noted that Congressional legislation mandating a cut in funding to the PA if it made any “unilateral” move in the UN “outside the context of negotiations” does give the Secretary of State the option to waive financial sanctions in the interests of U.S.”national security”. The full televised version of the interview of Palestinian President Mahmoud Abbas by Israeli Channel Two TV was ten minutes long, and was aired on November 2. It can be viewed on Youtube here, or — with all the ads — on Israel Channel Two’s website here. But, it was 2-minute preview aired the night before that got the most play, at least here in the region. DID ABBAS RENOUNCE THE RIGHT OF RETURN? In that 2-minute preview, Abbas responded to the mention that he was born in Safed [in the 193os, under the British Mandate], by stating that he personally has no intention to live there any more [unsaid: under Israeli rule], but that he would like to visit there — which is his “right”, he stressed, and which he said he has already done at least once [together, he indicated, with someone else sitting in the room at the time the interview took place]. Abbas was speaking from a position that is based on the Camp David talks in late July 2000 [between Israel’s then-Prime Minister Ehud Barak and the late Yasser Arafat]. In these talks, which led to no conclusion, as well as in subsequent talks in Taba in January 2001, which also led nowhere as Barak lost reelection, the Israeli team stressed what is a majority position in Israel: there can be no “Right of Return”, and any “return” will be minimal and miniscule. A formulation to make this somewhat more palatable to Palestinians was mentioned in these talks, and was in a speech to the UN General Assembly in September 2000 by Israel’s Foreign Minister Shlomo Ben-Ami, who said that Palestinian refugees can only “return” to a future Palestinian state [as it later emerged, and this can happen only with Israeli control and approval]. This was also the formula adopted by the Geneva Initiative between Israeli + Palestinian “civil society” — and was one of the main reasons that many Palestinians scorned, and denounced it. But some others, who were involved with the Geneva Initiative [including Abbas, though invisibly] believe that it was the only way to move things forward. What Abbas was saying in the interview conformed to that negotiating position. This whole matter is rarely ever discussed fully + clearly among Palestinians, in part because feelings are so strong and positions are so…determined. The interview was conducted by Israeli Channel Two TV’s Udi Segal, who shot rapid-fire questions in English. Abbas began to answer in Arabic, but after about four minutes he switched into English.